The live count of opossums currently stands at 2. 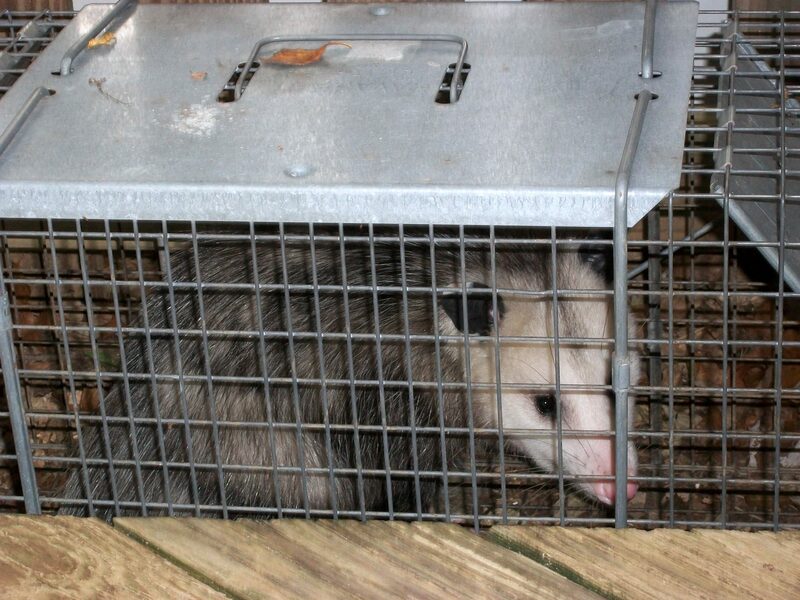 When I set the traps, I debated and debated about what to do once I caught the opossum. Upon hearing about my dilemma, one student was eager to suggest shooting it. While gunshots would blend into the background in the city, I thought that plan was ill-advised. One student offered to keep the opossum as a pet if I would put it on a leash and bring it to him, also clearly not an option. I seriously considered rat poison, but then I would have had to get rid of the carcass without any domesticated animals getting to it and getting poisoned second hand. The thought of putting a dead animal in four layers of trash bags and taping it up in a box to go out to the trash was distasteful. Plus, it was doubtful that the stench would stay contained for four days. The most plausible option seemed to be to drown the opossum by submerging the cage into a trashcan and then throwing the body into the road for the city to come pick up. 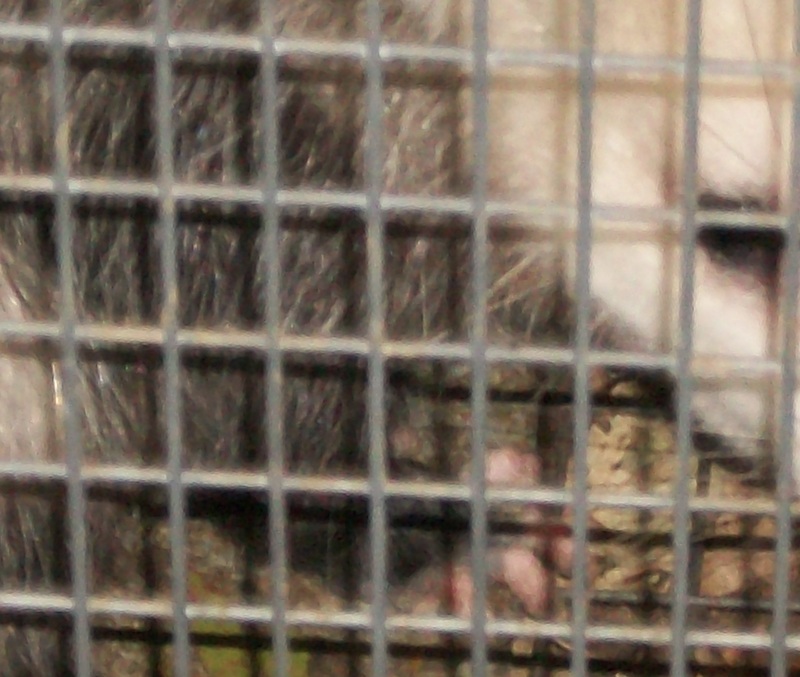 However, the cage wouldn’t easily fit into the trashcan, and I thought the city might ask how the opossum got soaking wet and why he was lying in a river of water in the middle of an otherwise dry alleyway. Plus, the bottom line with all of the plans involving death is that I think at the end of the day, I really couldn’t have brought myself to carry them out. I would have been haunted by guilt my whole life over the opossum, just like I still think about that poor little squirrel that I ran over once. So, I went to Home Depot, trying to psych myself up to release the opossum. I definitely wanted gloves, the thickest leather gloves possible to empty the cage. As I walked past the thatching rakes, I was once again tempted to use means of violence, but I realized I would never, ever be able to kill an animal with a rake. Ruling out death (again), I turned my attention back to the gloves. I was frustrated to find only large leather gloves. I could hardly bend my hands in them, and gloves do would do me little good if I couldn’t open the cage with them. All was not lost though, I found medium gloves lined with — kevlar. If it’s good enough for bullet proof vests, I figured it might be somewhat impervious to animal bites. And, I put a desperate plea on Facebook asking for help. This was after I called a government agency to verify that, indeed, paying taxes does not entitle me to opossum removal services. It’s always worth asking. I really did NOT want to use those gloves, even if kevlar is amazing stuff. Fortunately, one of the writing center tutors saved me from the agony of donning my gloves and rainboots — in case, I forgot to mention it, my rainboots are like my super hero outfit when it comes to disgusting work, like cleaning up dead animals or chasing down live ones. The tutor said he would be right over. When I expressed doubt, he assured me he had released animals into the wild before. So, I gave him a curtain rod to hold the cage open just like the manual I had consulted online said to do. Well, the manual online said to use a stick, but a curtain rod is easier to procure in the city. And, off the opossum went. All was peaceful…until Friday morning when the MEAN one showed up. The writing center tutor came to the rescue again, two of the tutors this time. So, I decided I should ride along to see how to release the opossum in case I had to do it by myself on the next catch. We found a nice area of woods. I wanted to jump and dump — leaving the opossum tumbling into the grass and wondering which way it was to the woods while I peeled out in the car, away from the no trespassing sign and back to my normal life. The tutor insisted we be humane, so he carried the cage to the edge of the woods. The opossum took his sweet time stewing around in the cage, good and mad even after the door was open. Then, he darted out and disappeared with the approximate land speed of a cheetah. Now the traps have been empty for two days, and I sure hope that’s the end of the opossums. I had to use copious amounts of Lysol to get rid of the stench in the trunk, and it’s asking a lot of my rainboots and gloves if I have to go release a fanged, clawed animal with the speed of a cheetah into the wild all on my own next time.